Last year, the Assassin's Creed series turned the clock all the way back on the Assassin and Templar orders whose struggle through the ages is at the core of the series' narrative. Assassin's Creed Odyssey moves the clock even further back to 431 BCE, making it a prehistoric game as far as the Assassins are concerned but giving gamers the chance to explore Ancient Greece during the Peloponnesian War and be a part of world history. Setting an Assassin's Creed game at a time before there were any Assassins may make a few of the series' purists scoff, but there is no doubt that Odyssey is an Assassin's Creed game once you play it. The parkour, stealth kills, naval battles, and everything else you'd expect from an Assassin's Creed game are here - you even get a few Abstergo moments. 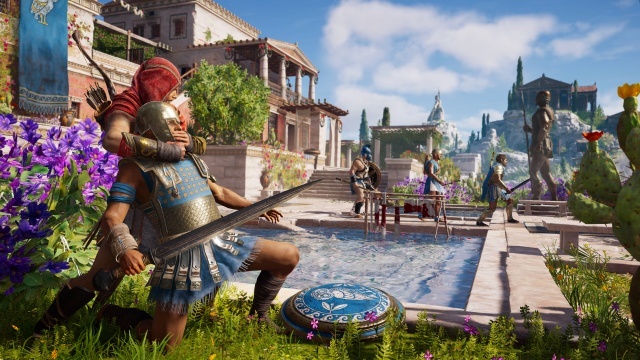 In Odyssey you'll be taking on the role of either Alexios or Kassandra, the first of many choices the game will leave in your hands. Odyssey takes the stealth-action game series that Assassin's Creed began as and gives it a rather large push in the RPG direction. Character conversations are no longer relegated to pre-rendered cutscenes during which you sit back and passively watch them unfold, you'll regularly be an active participant in them. These conversations have a greater impact on the game than simply deciding whether or not to accept a side quest, many of your answers will determine how the world views your character. For example, do you demand payment after helping someone by retrieving a stolen item for them or do you simply return the item to its rightful owner because it's the right thing to do? Some choices will send the story down different paths and you'll be surprised to find that some of these decisions will be difficult to make. The game's RPG aspects extend beyond the story. The game's skill point system is divided into three trees, hunter, warrior, and assassin, which allow you to customize your character for ranged, melee, or stealth-based combat. The gear in the game also come with bonuses tied to these three disciplines, and can be further customized by having them "engraved" by a blacksmith to add additional stats or bonuses. Engravings require a certain amount of resources to be applied and so serve as the game's light crafting system. Gear is also given a level rating, and your character level must be at least as high as a piece of gear's level for you to equip it. This also means that you can out-level your gear rendering it effectively useless against the higher level enemies you'll face as you level up, but you can have a blacksmith upgrade equipment for you for a price if you want to hang on to a nice piece of epic equipment for a while longer. There are many classes of weapons that lend themselves to different attack styles, so you'll need to give more consideration to which weapon you will equip beyond simply selecting the one with the highest overall rating. Your gear in conjunction with the skills you've chosen to select gives you an overall attack rating in each of the three attack disciplines. Your specialization doesn't preclude you from attacking enemies using any of these disciplines, but you'll have more success overall if you primarily rely on your specialty. If you've played Origins you'll be familiar with the basics of combat in Odyssey. Stealth attacks still involve sneaking up on your target from behind or above, although if the target is a higher level than you assassination attacks won't necessarily result in an assassination. Your basic battle command repertoire consists of light and heavy attacks and parry and dodge moves. Success in battle is based on timing and closely observing your opponent's movements, as well as using the right tactics for the type of weapon that you're wielding. Special attacks earned though the skill trees are executed by a combination of a trigger pull and a button press which is somewhat awkward especially when you're in the middle of a fight. On the other hand, the game's traversal controls have never been better. Problems that plagued earlier games in the series that had you leaping off of a wall or grabbing a random piece of the environment at an inopportune moment have been entirely worked out. Traversal through towns and fortresses feels fluid and natural to the point that you'll move across rooftops and over walls with ease without giving a conscious thought to the controls. Origins introduces a new mercenary system to the game. Mercenaries are essentially mini boss characters who will roam a province trying to hunt you down. Some mercenaries come with the territory, while others are hired by the local governor if you start causing too much trouble for the government or steal from or slaughter the local citizens. This adds a "wanted level" system to the game which can make things a little difficult for you if you generate too much heat. Mercenaries will begin to show up at the most inconvenient times and places, such as when you're trying to clear out a fort so that you can get to the treasure that it protects. Luckily the governors are always open to bribes, so you can pay your way out of trouble if you'd prefer not to fight your way out. On the other hand, mercenaries do tend to carry some pretty nice gear, so there is a reward to taking them on. The world of Ancient Greece created for the game is massive in scale. It will take you nearly six hours alone just to fully explore the small island that you begin the game on and complete all of the missions and side quests there. Once you obtain a ship and open up the rest of the Greek islands and mainland to exploration you can easily spend ten times that much time after that. While you'll still find map markers indicating areas that contain a place of interest that you can discover, the game encourages exploration as well by giving you clues to the locations of special items and quest goals and leaving you to study the map to zero in on these places based on those clues. This world takes the "living breathing" description to a whole new level. People aren't just pedestrians walking along a preset loop, but are going about their lives, working, eating, sleeping, the level of immersion is very impressive. Since this world is also a world at war, many of the provinces are under the control of Athens or Sparta and as a mercenary you'll often be at odds with whichever city state is in charge. Wresting control away from the ruling power involves assassinating the region's leader, which is very difficult to do unless you weaken his grip on the region by burning supplies, raiding forts, and other covert partisan activities. Once a region has been weakened sufficiently, a conquest battle can be launched to take full control. This is like an arena fight between two teams of warriors that continues until one side is eliminated. You'll be an active participant and your presence will be needed to turn the tide in your side's favor, but just surviving the battle can be challenging. This is because you'll always draw the attention of enemies two at a time and you won't have time to heal between each duel. It's a battle of attrition and hits you take in your first fight can prevent you from surviving to the end. Assassin's Creed Odyssey is a massive game set in an incredible recreation of an ancient world. I wish the special moves were a little less clunky to use and that assassinations always resulted in kills, but these are minor complaints when compared to the fun that I had in the game. 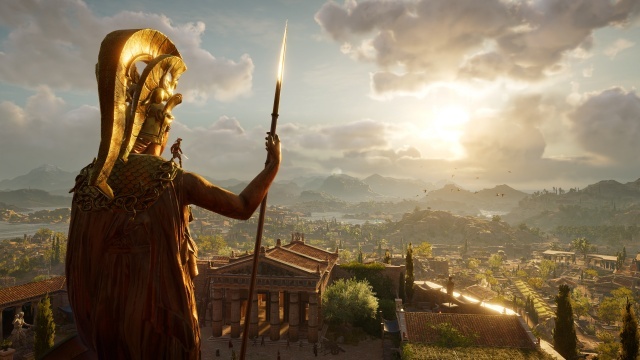 It might not be an Assassin's Creed game in the strictest sense, but the journey across Ancient Greece that Odyssey took me on was well worth the ride. Final Rating: 92% - This journey is epic.